Nigel Slater is much respected in my kitchen. I’ve been religiously buying his cookbooks for over a decade now, and his recipes are the first thing I check in the Observer every Sunday morning. There is an ease and simplicity about Slater’s recipes that I like – his is the kind of easy and relaxed food I love to cook and eat. This week, duck with apples and blackberries. I seasoned a couple of duck legs with some salt pounded together with thyme and pepper, and then browned them in a hot pan, the duck’s fat oozing into a thin puddle. 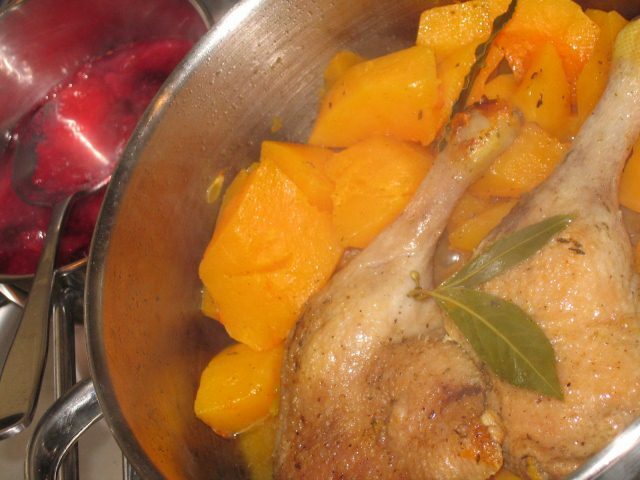 A peeled and chopped butternut squash was tossed in the seasoned fat, a pair of bay leaves added and the duck laid on top. On went a lid and the dish gently cooked for 50 minutes or so. Meanwhile, I stewed some Bramley apples with a handful of blackberries, adding a small amount of sugar just to cut through the sharpness of the apples a little without taking away the tang. The duck was tender and moist, not at all crisp, as it usually is, the meat steamed in it’s own juices. The squash had lost it’s form to the point of near collapse, and was flavoured by the thyme and the unmistakable gaminess of the duck’s fat. The apple and blackberry sauce, added in a small portion as an accompaniment worked well with the duck, the acidity offsetting and balancing its fatty richness. Nigel Slater’s recipe is here.